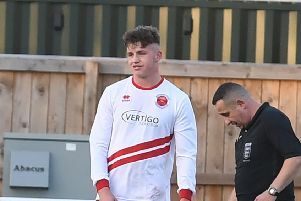 Skegness Town eased their relegation worries with a 3-0 victory over fellow strugglers Ollerton Town, who finished the game with 10 men. In a match affected by a swirling wind, the Lilywhites got their noses in front just before half time and then added two late goals to leap five places up the league table. 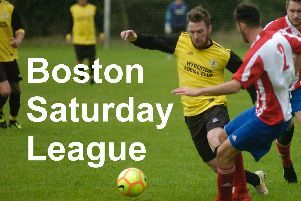 With most of the Division One matches postponed due to heavy rain, Town took full advantage to edge closer to safety. Some will look at their league position of 13th and consider them safe, but things are so tight in the lower reaches that nothing is yet guaranteed. The more cautious would prefer another three points in the bag before breathing a sigh of relief. This was the seasiders’ fourth away victory of the current campaign set up by Gary King’s first goal of the season for the club after Will Britton’s shot slipped under the body of James Leverton in the home goal. It came right on the stroke of half time and the home side were visibly hurt by it as they walked off for their interval refreshments. But there was worse to come for Ollerton. Within three minutes of the restart they were down to 10 men following the sending off of Chris Timons, allegedly for an elbow in Britton’s face. Even with a man short they continued to press for an equaliser and the seasiders’ Ben Sibbick had to be alert to clear off the line to deny Liam Cooper. Then just before the hour the home side were awarded a golden opportunity to level the scores. Courtney Warren was adjudged to have fouled Gav King in the visiting penalty area and the referee pointed to the spot. Sam Stretton stepped up to take the responsibility, but his spot kick was brilliantly saved by James Lambley, who dived to his left to push the ball onto the post. The seasiders organised themselves to defend their lead for the remaining half hour and the battling displays of the whole team earned them the spoils. On the counter attack Jordan Smith’s 10th goal of the season, and his first since November, knocked the stuffing out of the home side. Then Josh Morrall added a third in the last minute to completely avenge the 3-0 reverse the Lilywhites suffered at the hands of the Nottinghamshire side in November. Assistant manager Nick Chapman was buzzing after his side’s victory. “We asked for 100 per cent commitment and that’s what we got,” he said. TOWN: J. Lambley, L. Lambley, J. Morrall, Sibbick, Norburn, Forth, Ford, King, Evison, Britton, Warren, Smith, Ralph, Nichols, Clarke. On Saturday the Lilywhites entertain Hallam FC from Sheffield at the Vertigo Stadium (KO 3pm).